"Easy and elegant chicken dish. It's a great way to use leftover chicken or turkey. Green pepper and red pimientos make this a pretty dish to serve at Christmas or anytime. Serve over cooked rice, toast, or noodles. Can be made ahead and reheated." Cook and stir drained mushrooms and green pepper in butter or margarine over medium heat for 5 minutes. Remove from heat. Blend in flour, salt, and pepper. Cook over low heat, stirring constantly, until mixture is bubbly. Remove from heat. Stir in instant bouillon, milk, water, and reserved mushroom liquid. Heat to boiling, stirring constantly. Boil and stir for 1 minute. Stir in chicken and pimiento. Heat through. It's good to be the king! 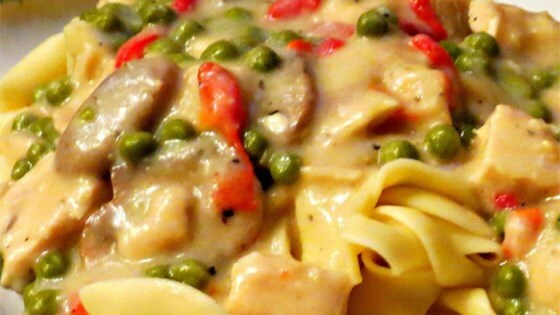 This easy, creamy chicken dish is ready in no time. I made this recipe and my husband and I love it. The only thing I changed was that I substituted chicken broth for the water and it was excellent!